With the invention of the flat screen TV, the enter­tainment center has gone through some exciting design changes. As TVs reached the sizes of 31" and 35", they had become super heavy, and very deep. Entertainment cen­ters and TV cabinets then needed to be over 27" deep to house these monsters. This resulted in pieces that not only took up valuable space, they were bulky and imposing in design. 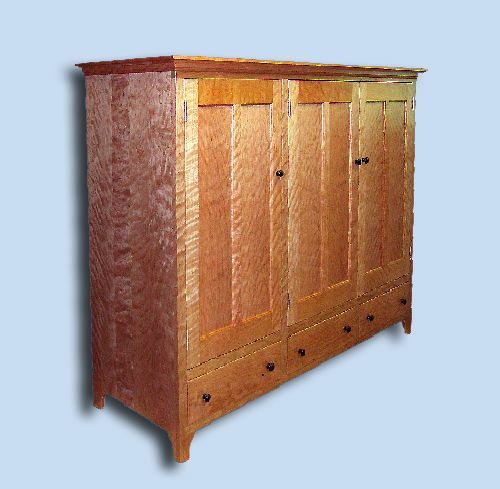 This stunning Shaker piece was built to order of solid heirloom grade flame cherry. It measured 64" wide x 55" high x 20" deep. The knobs were hand turned of black walnut wood. The door panels were book-matched out of wide planks, resulting in no glue joints. Though the modern trend is to hang flat screens on the wall, there are still those who prefer not to have to look at them, when of coarse, they're not looking at them! 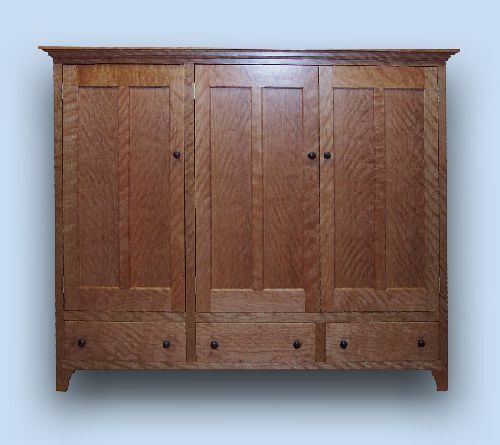 Today we hide flat screens and stereo equipment in all sorts of furniture, but entertainment centers such as this Shaker cupboard are still by far the favorite choice. Custom built to any size and configuration, we can build a piece to accom­modate all your home entertainment needs. 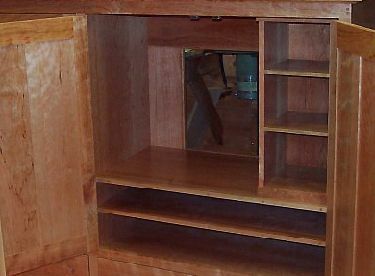 The clients who ordered this cabinet were planning on using their existing TV, but wanted the ability to have a piece of furniture grow into a larger one later. 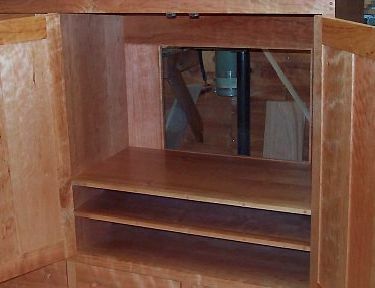 We designed a removable bookcase that not only could be removed to create a larger TV compartment, they then had an additional small piece of furniture. A shot with the bookcase removed. 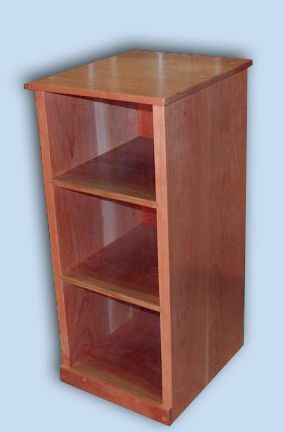 A removable bookcase is just one of the hundreds of ways we have helped our clients with a particular need through creative design.